While some children are more inclined to worry than others, almost all children experience anxiety at one time or another. Anxiety can be a good thing. It can make us pay closer attention to what is going on, it can help us to be better prepared, and the right amount of anxiety is necessary for best performance. However, anxiety becomes a problem when it keeps a child from enjoying everyday things, or when it is hiding a problem that needs to be addressed. Is the child not ready for the activity? Some children want to watch before they try and others just need more time before launching into something new. Does the child need some reassurance? If you feel your child is ready for the activity, then confidently assure him that things will be okay and that you (or the teacher, or other trusted adult) will be available to help. A child’s confidence about trying new things can be greatly improved when he or she successfully accomplish something that caused worry. Is there something else going on? If a child suddenly is anxious about a previously enjoyed activity then a good conversation is in order. Your child might not realize that an incident with another child, some confusion with an adult, or a startling event, is the real cause for worry. Children cannot always process this information. On occasion their brains will simply cause them to fear the entire situation. Is your child defiantly refusing to obey? It is easy to assume that defiance is about disobedience rather than anxiety. We assume that anxiety will show itself in timid behaviors. Some children show their anxiety in defiance. It is good to explore this possibility, especially if the behavior is unusual for your child or if typical consequences aren’t working to change the behavior. Is your child tired? 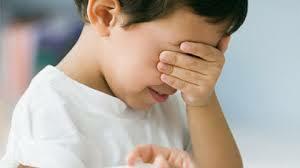 Being physically tired or mentally overstimulated will cause many children to become anxious. For them, it is the best way to give the message that they have had enough. Helping children to identify and cope with stress is a great way to build resilience. Children need ways to calm themselves, to know when and how to seek help, and to learn to use anxiety to their advantage. Such children will be good problem solvers and will face difficulty with confidence. One of the reasons that faith development also promotes resilience is that our faith reminds us that God is in control of our lives, our situation, and our anxiety. A gentle reminder of God’s promise of love and care is a beautiful way to share your faith with your children when helping them with anxiety.